When I started researching the school’s history for my PhD, I discovered the fascinating story about the origins of Italian teaching at the school. In 1935, there had been a strong push for the establishment of Italian and a high profile meeting was held in Melbourne, which was attended by many academics and influential figures in the education field. The President of the Dante Alighieri Society also supported this move, and wrote to the Education Department, urging them to introduce Italian into the Victorian education system. Mr J.A. 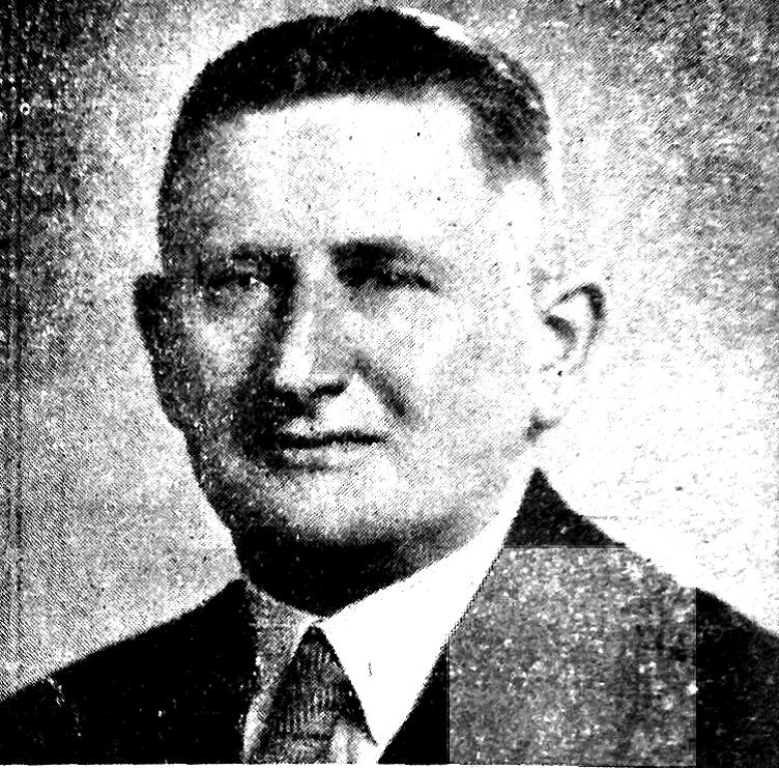 Seitz, the Chief Inspector of Secondary Schools, supported the establishment of Italian. 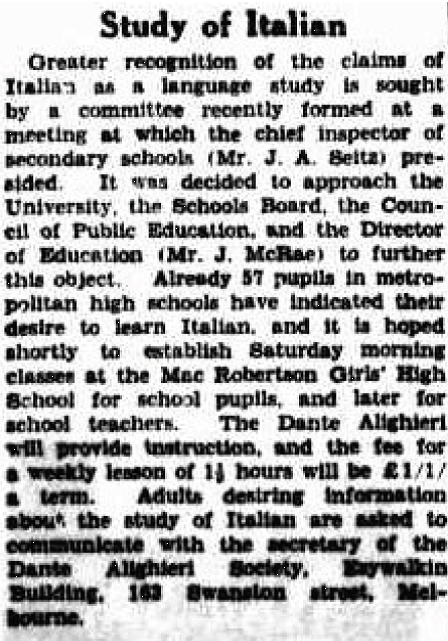 The first Italian classes were held on Saturday 8th of June 1935 at MacRobertson Girls High School as a “special experiment”. The idea was to trial the classes as a pilot, to ascertain the level of interest among Victorian students. If the classes were overwhelmed with enrolments, Education Department officials would consider rolling the Italian curriculum out to a small number of mainstream schools. The decision to establish Italian was a historic one, because up until that time, Italian was not being taught in any Victorian government schools. These events were reported in the Melbourne newspapers (see article). The high profile Italian businessman Gualtiero Vaccari supported the Italian classes by donating fifty guineas in prize money. The prizes were awarded through the Italian Consulate to the highest achieving students and to the first day school to introduce the language into its curriculum. One of the prizewinners was Miss Wilga Rivers, a student at MacRobertson Girls’ High School. She later recalled “the enthusiasm of the students and the happy atmosphere in the class”. With her knowledge of Italian, she went on to study other languages and she later lived in the U.S. where she completed a PhD. 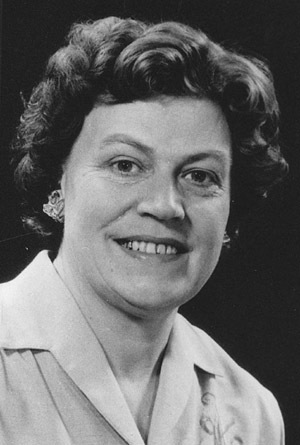 In 1973 she became one of the first women to be appointed a full Professor at Harvard University, where she played a key role in the languages department. The Dante Aligieri Society also supplied the early teachers. In 1935, one of the original teachers was Dr Bartolini, and the teacher in charge was Miss Helen Byrne. 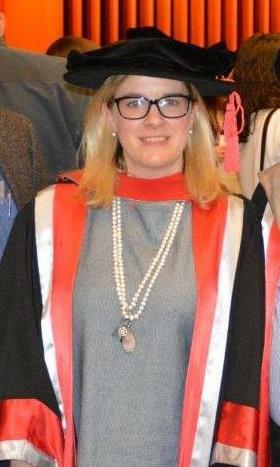 A graduate of the University of Melbourne, Byrne had just returned from a year at university in Perugia on a postgraduate scholarship. She had just gained a “diploma per l’insegnamento del Italiano all’estero” which gave her the right to teach Italian in foreign schools. From 1941 onwards, Mr Virgil Cain taught Italian at the school, which he did in earnest until 1964. In 1935, it was not only children who attended the Italian classes. A special class for teachers was also formed. Education Department officials recognised that this was an important long term step towards helping the language to be established on a solid footing in Victoria. The teachers were charged £1.1.0 per term for 12 lessons. The early attendance rolls of the Saturday classes show that it was English background speaking children who enrolled in the classes. Language study in the 1930s and 1940s was still considered important “training for the mind” and it was often a prerequisite for university entry. In this sense, language study was an elite pursuit. Students who gave up their Saturday mornings to attend the Italian language classes generally came from middle class families and they had already excelled at either French or Latin in their day schools. It would not be until 1956 that this emphasis on Italian ‘high culture’ would gradually begin to shift and it would start to contain features of a community language. 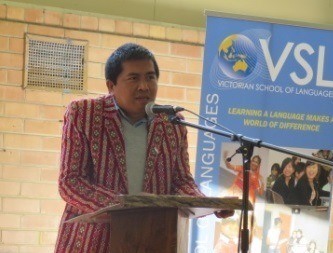 On Saturday 29 October the VSL held a historic function to launch new Chin Hakha VCE Textbooks for Year 11 and Year 12. 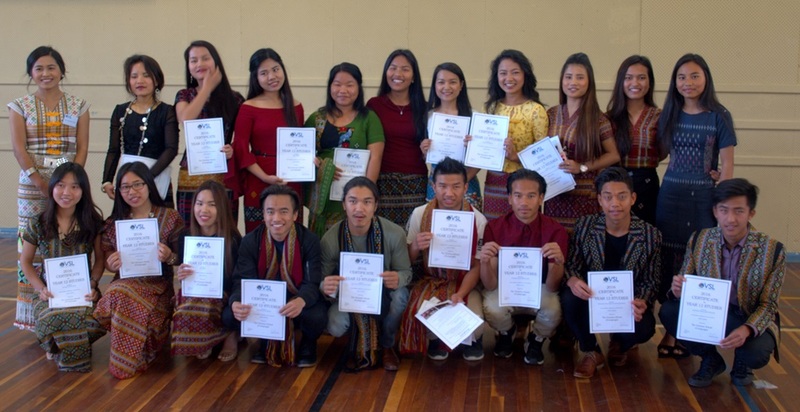 At the same time there was a presentation of awards to the inaugural Chin Hakha Year 12 students from the Croydon and Sunshine VSL Centres. The launch was held at the Croydon Road campus of Melba College which hosts a VSL Centre. This was one of the most important VSL functions of the past decade and a world first. The settlers from Myanmar are relatively new arrivals to Victoria and Australia and they have come from refugee camps in Thailand and Malaysia. Some of the community have spent many years in these camps. In addition, they were not able to study the language formally in their country of origin. (Chin Hakha is only taught to lower primary levels in Myanmar). They are absolutely delighted that in Victoria classes for their language were taught and funded by an official arm of a Government’s Department of Education. 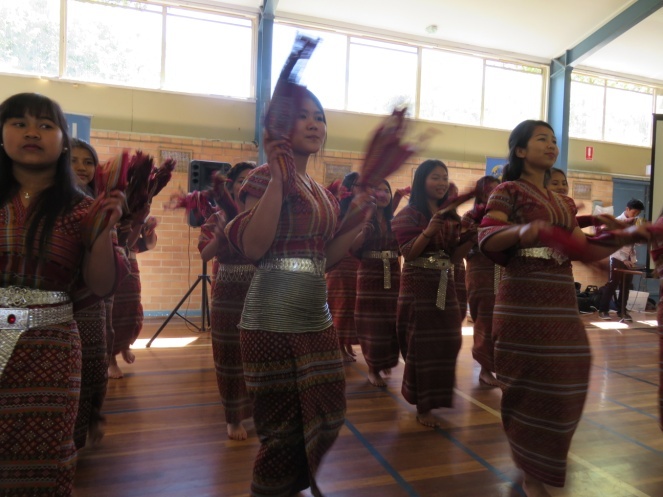 The joint collaboration between the Victorian Curriculum and Assessment Authority, the Victorian School of Languages and the Chin Hakha Community has culminated in Chin Hakha being formally taught to Year 12 level. 2016 has seen the first Year 12 Chin Hakha graduation. This accomplishment is a world first. According to the VSL principal, Mr Frank Merlino, there has long been a demand to increase the number of languages and classes in the Croydon area. “The VSL is delighted to assist emerging communities to forge partnerships with educational bodies in order to assist with language delivery for their community. This leads to a wider language curriculum choice for primary and secondary students from the government, Catholic and Independent school sectors” he said. 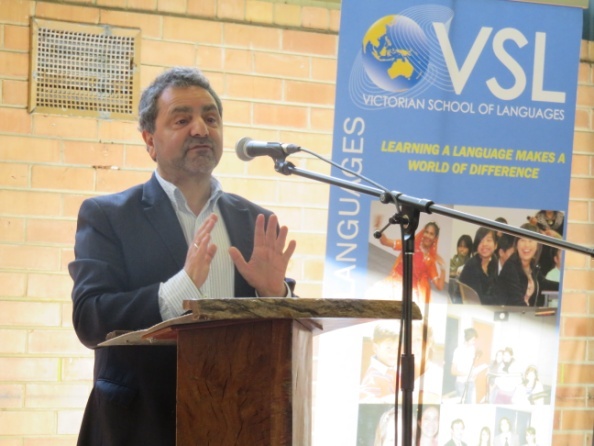 World renowned Professor Joseph Lo Bianco addressed the invited guests, parents and students on the global importance of language learning, the integration of immigrant children into mainstream schools and multiculturalism. He is Professor of Language and Literacy Education at the University of Melbourne and has extensive experience in global language policy development. He has been visiting Myanmar for the past seven years to work with the authorities on language planning including a UNESCO project to include minority languages in mainstream education. Mr Terrance Bennett, the Principal of Melba College spoke of the great partnership between his school and the Victorian School of Languages where there are now 19 VSL classes. Mr Bennett said that, “in a global society, the study of languages helps promote global understanding; social cohesiveness and can significantly enhance students prospects in the future.” Melba College is keen to promote the study of languages in the Maroondah area in partnership with the VSL. The launch was done by Mr Shaun Leane representing the Premier. He praised the initiative and thanked a variety of people who had assisted in the achievement of this milestone. 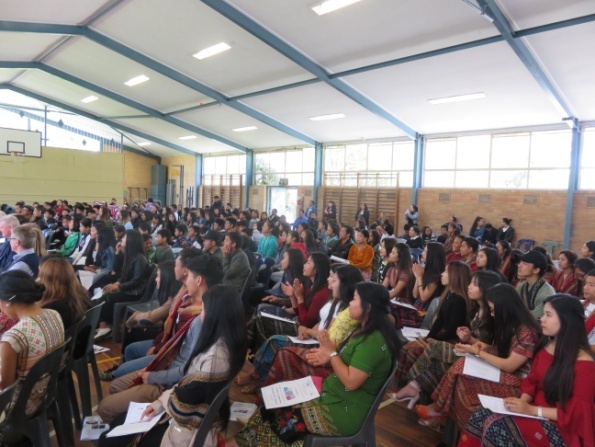 This included the author, Mr Lian Ding Hmung, the first cohort of students, the Victorian Department of Education, the Victorian Curriculum and Assessment Authority, VSL teachers and administrative staff, the Chin Hakha language panel and community members. Mr Lian Ding Hmung who is both the Chairperson of the Australian Chin Community and the writer of the two VCE textbooks spoke about the project. The final speaker was Mr Salai Bawi Lian Mang who is the Executive Director of the Chin Human Rights Organisation and is based in the United States. The Victorian Curriculum and Assessment Authority had a large delegation composed of the John Firth (CEO), Maree Dellora (Manager of Languages), Gabriella Bertolissi and Xenophon Arthanidis. There were representatives from neighbouring schools including Christina Shaw (Principal of Yarra Hills SC), Alex Perry from the Blackburn English Language School and obviously from Melba College. Representing the VSL administration were Antonella Cicero, Joanne Lepore, Kevin Ryan, Pashalia Eglezos, Belinda Borkowski and Frank Merlino. 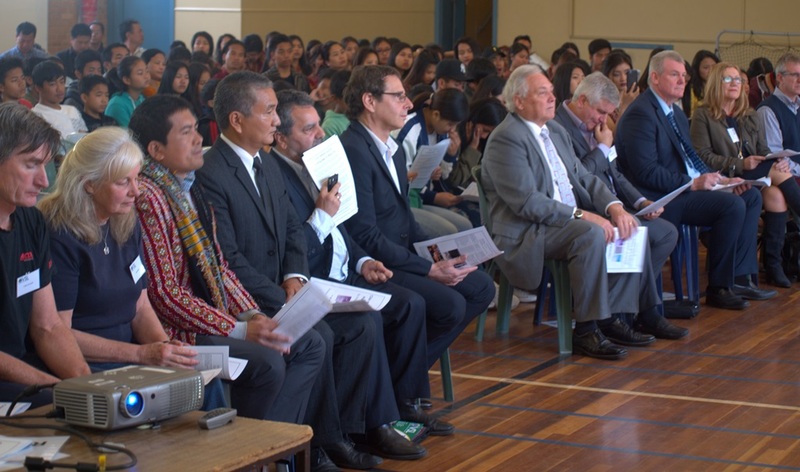 Also in attendance were the VSL School Council President, Dr Bruno Maschitelli, Andrew Hay from Independent Schools Victoria and a number of senior representatives from Burmese community organisations. After the speeches there were three student performances by students from the Mizo, Karen and Chin Hakha classes. The function concluded by the awarding of Certificates to the first ever cohort of Year 12 students. The VSL taught the language at the Year 12 VCE this year to 29 students from the Croydon Centre and seven from the Sunshine Centre. Congratulations to the graduating students, and Mr Lian Ding Hmung, author of the textbooks. According to the British Council, more than half of the world’s population functions in two or more languages on a daily basis. In other words, multilingualism, not monolingualism, is the norm and for some students, learning just one language other than English is not enough. Selma Makas is a student who is currently studying VCE Units 1 and 2 Italian at her home school, Belmont High School, whilst also completing VCE Units 3 and 4 Bosnian at the Victorian School of Languages. Both languages will contribute towards her ATAR. Here are some of her thoughts about her language learning experience so far. – What languages do you study? I am currently studying Year 11 VCE Italian and I am in my final year of VCE Bosnian, (Year 12) which I have been studying on Saturdays over the past 11 years at the Victorian School of Languages. – Do you get confused between the two languages? If I do get confused between the two languages it is times when I nearly say Bosnian words instead of Italian ones. But when speaking in Bosnian, for example, I would automatically think that word in English and Italian. So, in my brain I am constantly automatically translating what I am saying or thinking in all three languages. – Does language learning get easier or harder once you already have one under your belt? Luckily for me, my parents brought me up speaking Bosnian, explaining the fact it is my first language. I truly believe it is a blessing. It would be sad for me to not have learnt my mother-tongue and let it die off in a foreign country. Having one refugee and one immigrant parent, both fresh from war-torn Bosnia, their English was nowhere near good enough to be able to teach me. As a child growing up, in primary school, I had trouble learning English because I wasn’t surrounded by it as much in my early years. I did have many grammatical issues through primary school but once I got into high school, reading books, being more attentive to my word choices and sentence structure, I was able to overcome that obstacle. As they say, things won’t come to you all by themselves, unless you do something to get them. Study and putting into practice those skills you have learnt is the best way to improve in any language. After learning how to master a second language, I realised it was easier to learn any language now. From then, it all just came so easily to me, without one struggle. I realised this in my primary school years, when learning Indonesian, Japanese and even some German. What I found when I learnt another language was that I would subconsciously use my knowledge of another language. E.g. using Bosnian when learning Italian by using my knowledge of similar words and grammar structure. As you keep on learning any language, this flow on effect takes place. Prior knowledge of any language will make it easier for you to learn another language, it is the way the brain works. It is truly fascinating. – What made you decide to study two languages at the same time? I didn’t have trouble learning Italian during high school and I enjoyed it. To be honest, I was tossing up whether I should or shouldn’t study two languages at once, especially because I am doing year 12 Bosnian. I got scared I wouldn’t do well at either language and that I would get even more confused by learning two VCE languages at once. But I was clearly more wrong than ever and keeping up Italian was the best decision I made! Rather, it made my learning of both languages much easier. Completing Year 12 Bosnian also gave me a heads up for what I am to expect next year for Italian. – Do you think languages could help you in your future career? – How do you find managing your time whilst studying a subject outside of normal school hours? Well I think it isn’t just about managing time but actively learning and incorporating that language in your everyday life. Even if it is just in your mind and not out aloud. When you have parents who are teachers they are constantly nagging you to study more for my Bosnian even though I do complete everything (ha ha ha!). I think for learning any language, it is not good to do study sessions for a flat out hour or two, because you lose interest and can’t focus. That is why it is better if you do even 15 minutes or half an hour each day. Studying is useless if you aren’t putting your skills and knowledge into practice. I study mainly on Friday night for Bosnian because it will be fresh in my mind for Saturday, but speaking about my school work and just in general at home with my mum and dad is a great studying method for me. – Have you ever been to Bosnia / Italy? Would you like to go? To Italy, I have yet not been, but it is surely something I am looking into, and cannot wait for it to happen. On the other hand, to Bosnia I have been many times in my life and created many life time memories there from my toddler years through to my early teens. Bosnia is my home just as much as Australia is. It is just within, deep in my heart that I feel that deep connection, especially because 95% of my family is over there, it is my culture, my language and way of life which makes me feel that I belong over there too. There is a difference between a house and a home. – Would you recommend studying more than one language? Why/why not? I think it is so sad that many people dump the opportunity of learning a language be it Italian or Indonesian, especially when it is for FREE! Many people have an “I can’t be bothered” attitude towards learning foreign languages and I think it is mainly because they think English will get them through life and it’s all they need in this world. It is also that “minimum effort” attitude people have towards education in general. Nothing in life comes to you without studying and hard work, I am sorry to break the news here. As they say, languages open many windows of opportunities for you in life. You never know where life will take you and it is in the moments you least expect that you could possibly end up using your knowledge of another language. All in all, I encourage people to study more than one language if they enjoy it and are ready to commit. It is just that people see it as hard when they haven’t even tried. You will be amazed when you start learning another language how your brain starts working and linking things like a wired circuit in your brain. – You are currently studying year 12 Bosnian. Are there any tips you would like to share with other year 12 students of languages? – Active learning is a number one tip, especially if you are still in the process of getting the gist of a language – watch movies, read articles you like, write diary entries, listen to songs, make flash-cards. This is the great thing about languages – you can easily active learn. – As for when it comes to Year 12 and this can also be year 11, ask your teachers for help and advice! They are your best resource. I highly recommend writing pieces of work and constantly asking your teacher to check and ask tips on how to improve and expand your vocabulary choice. – Make sure you get your grammar on point! Once you get grammar concepts under your sleeve learning new words based on topics and writing and utilising them will be easier. – The closer you get to year 12, past exam papers are your best resource and ultimately your best friend. The hardest is listening and responding because of the speed which examiners speak with,+ so I highly recommend doing a lot of those. They can be found on the VCAA website. – When you have the opportunity to speak in that language, speak it! Good luck! In bocca al lupo! Sretno! When I started researching the school’s history for my PhD project, I discovered the fascinating story about the origins of Japanese teaching at the school. 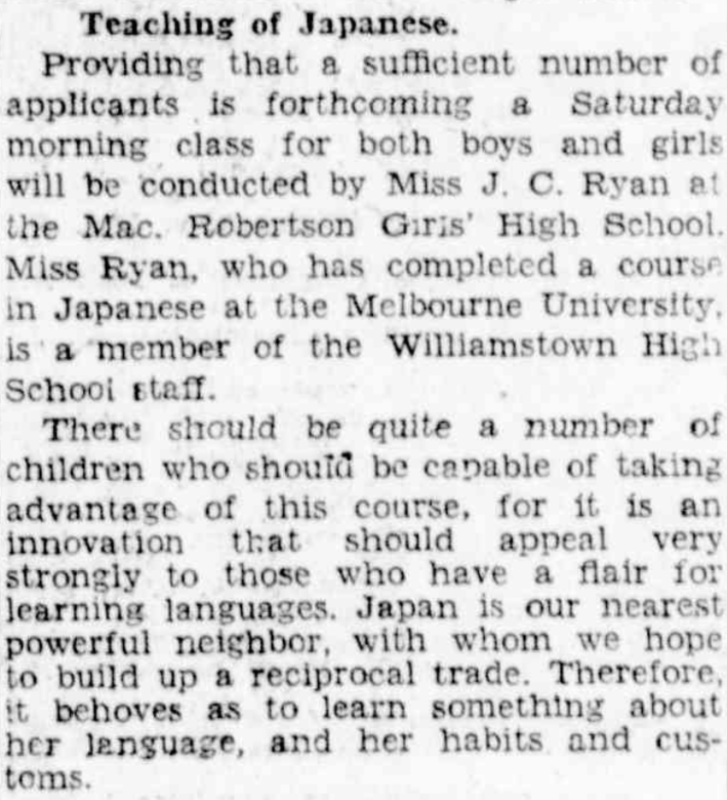 The first Saturday Japanese class was held early in 1935 at MacRobertson Girls High School. Mr J.A. Seitz, the Chief Inspector of Secondary Schools, supported the establishment of Japanese as a “special experiment”. The idea was to trial the Japanese classes as a pilot, to ascertain the level of interest among Victorian students. If the classes were overwhelmed with enrolments, Education Department officials would consider rolling the Japanese curriculum out to a small number of mainstream schools. At that time, the VSL was not actually a school. It did not have a name. But this curriculum innovation was a historic development, because Japanese was not being taught in any government school at the time. But education department officials knew it was necessary for Victorian children to develop an understanding of Japan, which was fast becoming a powerful trading partner. They hoped that Japanese could eventually be introduced into the curriculum of one or two metropolitan high schools. The exact date of the first Japanese class is unknown, but they started early in 1935 and more than 50 students enrolled. 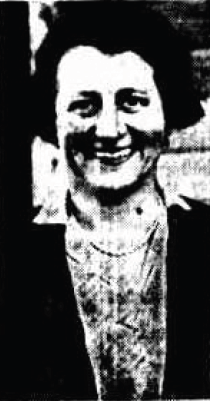 The teachers were Miss Irene Catherine Ryan, a French teacher from Williamstown High School, and Miss Amelia Pittman from Sandringham Primary School. They had studied Japanese for several years at the University of Melbourne, where it was taught by Mr Moshi Inagaki. Inagaki’s Japanese program only existed on the fringes of the university and it was not widely accepted. It was only offered as an extra subject and did not belong to any faculty. Despite this, and being paid very little, Inagaki worked enthusiastically to promote Japanese. It is thought that Inagaki supported the establishment of the Saturday classes. 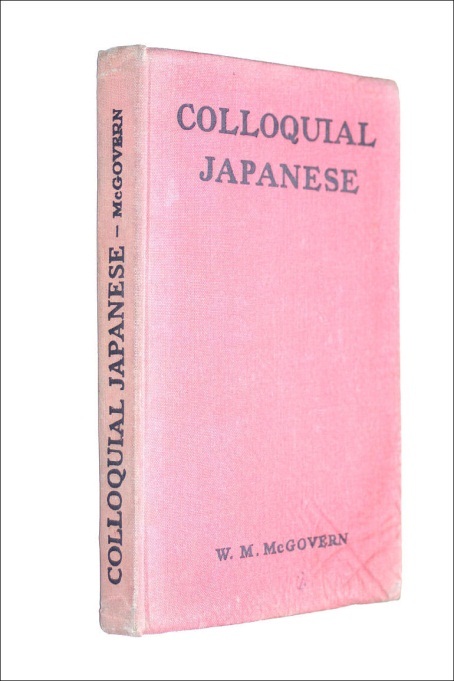 When the war broke out, Japanese language study went out of favour in Victoria. The idea to expand the Japanese curriculum into mainstream schools was shelved. Japanese was not introduced into mainstream secondary schools until many decades later. Mr Inagaki, who had worked so enthusiastically to establish Japanese language studies in Melbourne, was sent to an internment camp in Tatura in country Victoria, along with all other Japanese nationals, who were treated as “enemy aliens”. Throughout the war, the number of students who enrolled in the Saturday classes dwindled to such an extent that education department officials started to question the viability of the classes. But Seitz resisted this pressure and was adamant that they continue. Thanks to the vision of Seitz, who understood the value of language education, the Saturday language classes continued uninterrupted until the present day. 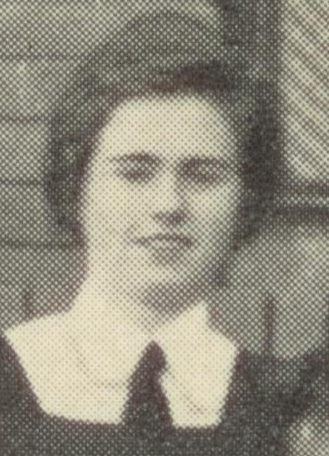 Nesta Potts (nee Doherty), a student of Japanese 1939-1941. Photo courtesy V. Brand and family. In conducting this research, I was very fortunate to make contact with one of the early students of Japanese. 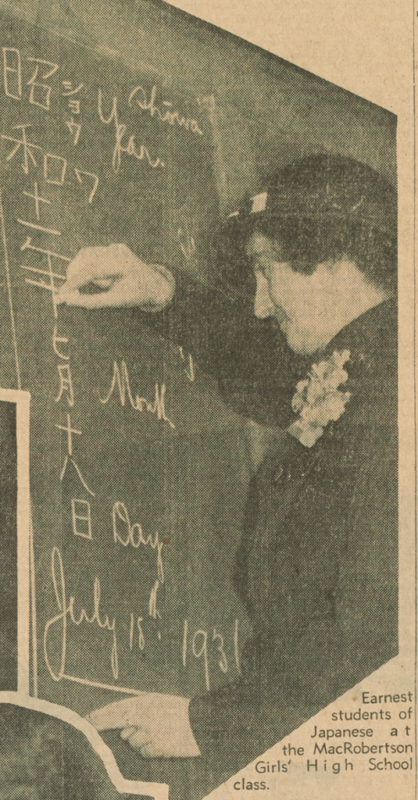 This was the late Mrs Nesta Potts (nee Doherty), a lovely lady who studied Japanese for three years on Saturdays at MacRobertson Girls High School, starting in 1939. When I met Nesta in 2013, she was in her late eighties, and was thrilled to be interviewed and to share her memories. Nesta was excited to show me her treasured Japanese textbook, Colloquial Japanese, by W.M. McGovern, which she had kept for more than seventy years. Her interest in Japanese study was initially sparked by her mother who loved Japanese art. Nesta recalled the “lovely atmosphere” of the Japanese classes. I can only imagine what it must have been like to be a sixteen year old in 1939, and I guess that Japanese language study on a Saturday must have been quite an adventurous and exciting activity for a young woman to pursue. After leaving school, Nesta joined Army Education, where she taught unit education officers, and she was able to continue her Japanese study. Nesta also had several opportunities to use her Japanese language skills in her working life. During the war, she was responsible for communicating with a Japanese prisoner of war. Later, Nesta became a teacher in the Education Department with a focus on Special Education, and eventually became a Principal. As Principal, there were occasions when she welcomed delegations of visiting Japanese teachers to her school. She recalled delighting them with her ability to speak Japanese. For a student and teacher of Japanese myself, meeting Nesta was a moving experience and it was an absolute highlight of my time as a research student. In the August 31 and September 1 editions of Guardian Australia, there were a series of very interesting articles on the state of indigenous languages in Australia: the first by Helen Davidson is an overview of the national scene and the types of programs that are being run. The second is a poignant personal reflection on the individual’s relationship to language and background by Stan Grant. 2. If language tells us who we are, then who am I? “Inspired by my father and to honour the traditions of our people, I have learned more of the Wiradjuri language. But I am the sum of many parts. Language and names are markers of identity. This is how we introduce ourselves to the world; how we explain ourselves to each other. I admire this conscious effort to keep themselves and their people alive in the world, but I am wary too. I am who I am and I am born of a country whose history is what it is. My struggle is to live free to determine my identity unconstrained by the expectations or definitions of others. It was a language that almost died but the efforts of a community – and one man – have brought Wiradjuri back to life. French Distance Education courses place great emphasis on culture and offer students vast opportunities to explore the rich world of French history and art. 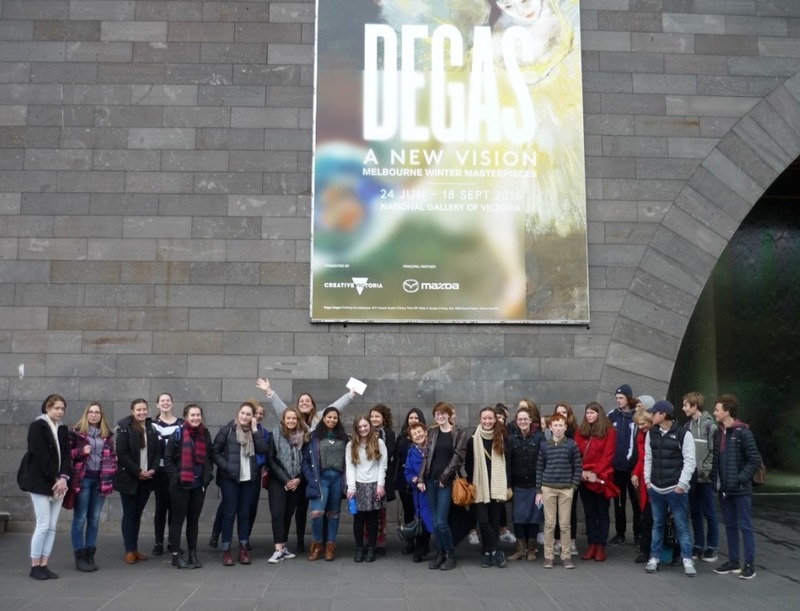 Every year the French faculty takes Year 11, Year 10 and Accelerated 2 Distance Education students to the National Gallery of Victoria for a guided tour of the permanent exhibition of French art, as part of one of our seminars. 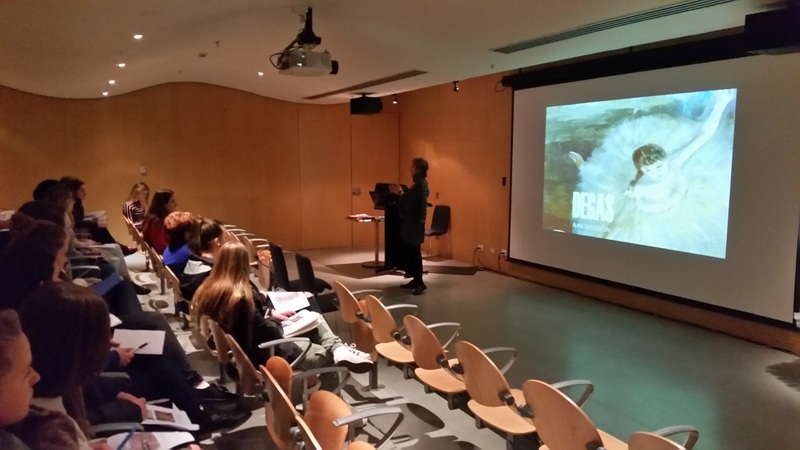 This year we were lucky to be able to combine a Seminar with a very special visit to the National Gallery of Victoria, which included a talk by a member of the NGV staff and a viewing of the exhibition “DEGAS – A new Vision”. Impressionism is one of the topics studied in Unit 2. It also features in the Reading Assessment Task, as well as an oral task. In the morning the Year 10, the Accelerated 2 and the Year 11 students mastered vocabulary related to the topic of art and paintings, then described some impressionist’s paintings, using newly acquired vocabulary and expressions. The vocabulary was selected appropriately for the differing language levels. This was followed by a listening comprehension activity with people expressing their views of a particular painting. Students learned to express their personal perception of and reaction to each work of art. After a short break for lunch, students accompanied by their French teachers went to the National Gallery of Victoria for a one hour lecture by a member of the Gallery staff and a viewing of the exhibition. I found looking at all the different styles of art Degas made very interesting. There were some amazing pieces of art work made in a range of mediums. Learning about Degas, his life, how he made his art, why he painted what he did and the historical context of his work gave us a broader understanding of the whole exhibition. Kyra Kerwin. As many people know, the VSL celebrated its 80th anniversary in 2015. Some may also be aware that for the past four years, I researched the VSL history for my PhD project at Swinburne University. This was a special project that was initiated by the VSL. It was supported by a three-year scholarship called the VSL PhD scholarship in memory of Professor Michael Clyne. Throughout this research project, the VSL gave its full support, and gave me full access to materials, documents and personnel for the purpose of this study. Indeed, the VSL community supported this research project enthusiastically. I was thrilled to be the chosen candidate, because I knew that this project was a special opportunity. While some people might wonder why anyone would want to pursue such a project, a PhD was something I had always wanted to do. I came to this project as an experienced secondary teacher of both Japanese and history, and it enabled me to pursue research in three areas of my own expertise and interest; languages, education and history. Prior to becoming a teacher I had completed a Master of Arts by research in Japanese, so I was familiar with what was involved in research, I had written a thesis before, and I felt confident that I had the skills to do it. I resigned from my teaching position so that I could work on this project full time from 2012 until the end of 2015. I submitted my thesis for examination in December 2015. Early on, I was struck by the enormity of the task. The VSL teaches 49 languages in 40 centres and it has an eighty-year history. My PhD thesis needed to be between 80,000 and 100,000 words. That sounds like a massive document, which it is. But my research needed to have a clear focus. I wondered how on earth I should approach such a mammoth topic within the limits of a PhD? I soon became convinced that my focus for this project should be firmly anchored in the discipline of history. I had found several old newspaper articles and government reports. But the most exciting discovery was at the Public Records Office of Victoria (PROV) in North Melbourne , where I found a box of archived education department papers that document the first decades of the school’s history. Dating back to the 1930s, the papers were dog-eared and fragile, and many were written in copperplate handwriting. These kinds of primary sources represented a goldmine of original material for my project. Among the documents, I discovered some original attendance rolls from the school’s first Saturday classes in Japanese, Italian, Dutch and Russian in the 1930s and 1940s. When I saw this, I realised that some of the early students or staff of the school may still be alive and be able to meet me for an interview. But there was a problem. For the first fifty years of its existence, the VSL did not have a name. It was not an official school. It did not have a building or a headmaster. It was not like a “normal” school. There was no database of alumni that I could consult. So how could I track down these ex-students? I noticed that in the margins of the old attendance rolls, education department officials had written the names of the day schools that the students had come from. This represented a vital clue. 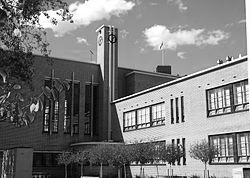 Many students had come from MacRobertson Girls High School, Melbourne High School, and University High School. I reconstructed the lists of names and approached staff at these three schools and asked them to help me contact these ex-students. This was a long process and it depended on the goodwill and generosity of people who patiently trawled through their databases for me. Through this process, I was able to meet several VSL students from the 1930s and 1940s. Meeting them was an absolute thrill and hearing their stories brought the box of archived documents to life. It enriched the information that I had found, and I was able to include snippets of their stories in my PhD thesis. This experience highlighted the valuable opportunity that this PhD project had brought. Without this special research project, the chance to meet these interesting people and hear their fascinating stories would have been lost. In the next few blog posts, I will write about some of the people that I met and some of the stories that I discovered from the early decades of the school’s history.